Hello friends! We're always complaining about how we don't blog enough- I'm embarrassed to say how many times we've blogged this WHOLE YEAR, I'll let you figure it out. (Hint: our Christmas gift guide from last year is not too far down there.) It's both good and bad, because blogging takes a backseat to actual design work which pays the billz BUT counterpoint, it's fun and we get to share on a more personal level with our followers. All that to say, it's a good resolution to have for next year. ANYWAYS, BATHROOMS. We've been on a bathroom roll lately- I think we have 9 under our belt after this year. ! So we know ALL the tile. These two bathrooms were so fun to work on because they were gut projects and also each had different goals and purposes. (Also amazing, trusting clients always make a project fun!) 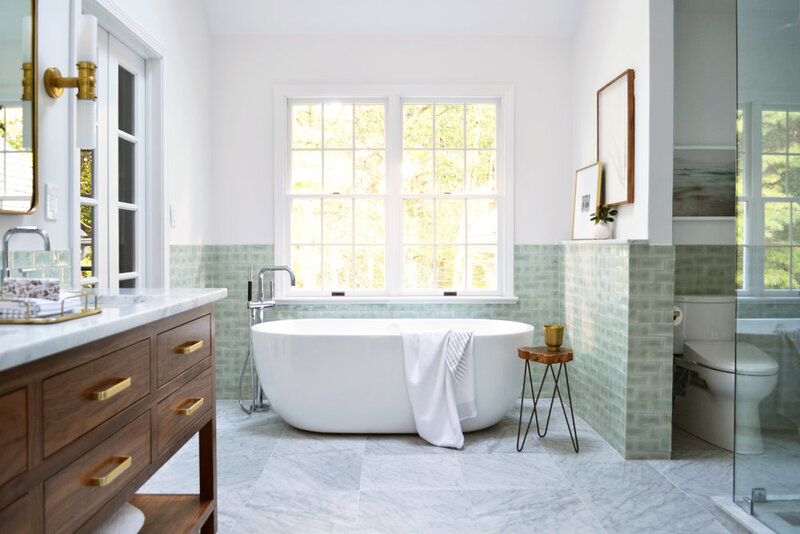 We broke this post into two because it was getting too long, so come back tomorrow for part 2 featuring the kids bath! 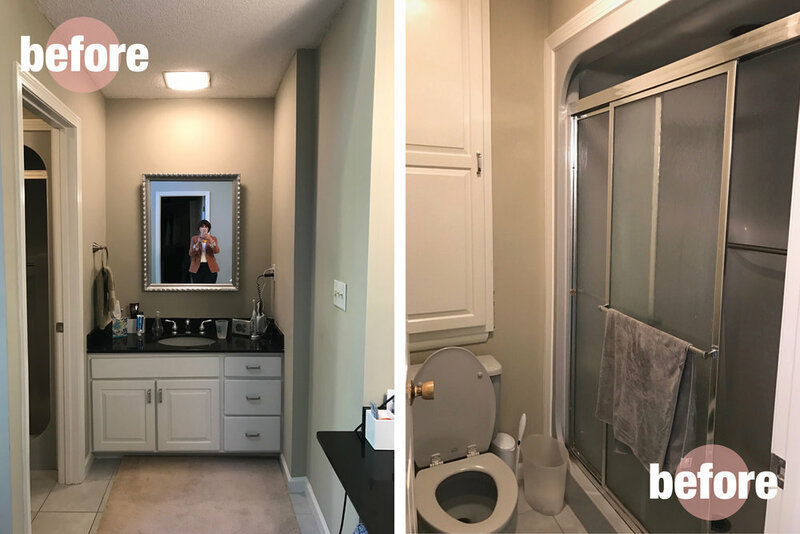 This post we're discussing the master bath which desperately needed a gut reno with lots of storage and a new tub. Check out that ridiculous tub! What were the 80s thinking?!?! This space was full of design challenges. There was a large and awkward amount of space in the toilet area, a super tall vaulted ceiling in just half the room, lack of wall space for a long vanity, a load-bearing dividing wall, and generally just lots of nooks and crannies. Our goals were to introduce built-in storage which kept the toilet area from feeling too big and in the center of the room, install a half wall of tile to keep the eye down and make the space more cohesive, move some doors around to make space for a long vanity, bring the load bearing wall back a tad and install a glass shower to open up the room. And it all came together with just a snap! JK it was a process and lots of back and forth plans but that's part of the fun. The transformation is pretty darn dramatic. That's it for the master... come back tomorrow for part two- the kids bathroom! Enjoy! p.s. The vanity and built-in storage were custom pieces built by one of our favorite cabinet guys in CT, Cabinet Specialties. Our dear readers, 'tis the season of joy, giving, and light! And also holiday movies, fresh pine, Christmas carols, glitter, vacuuming glitter, delicious gingerbread, twinkle lights and 60 degree weather. Or snow, which would be way better. It's Emily here, excited to discuss and share my Christmas decorations! (What can we say, we love them.) Last year, I BARELY decorated for the season and the year before that, I made a single wreath which was quite lovely but this year, I wanted to go all out and maybe a wee tad over the top. SO. I restyled a few things, added some fresh greenery, ornaments and candles, made a few wreaths, and of course, decorated a tree that I will be the first to admit needs like triple the amount of lights. 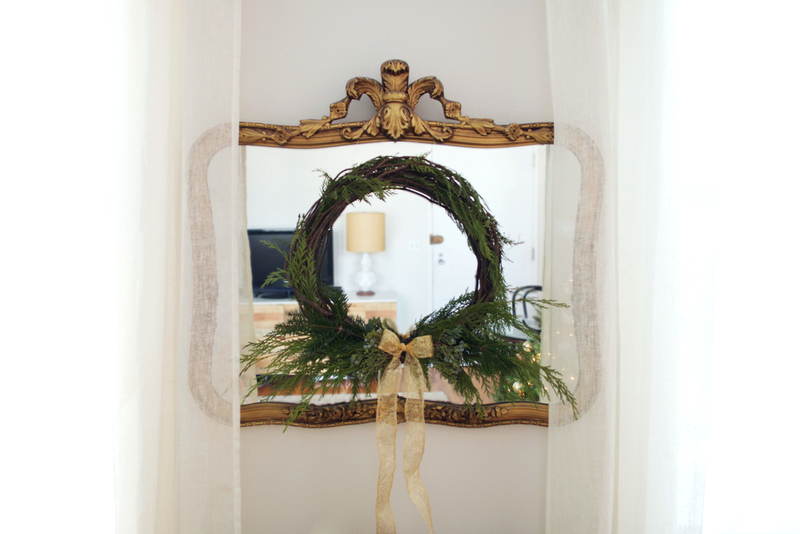 ANYWAYS, making wreaths with fresh greenery is just the best because no matter what you do, it turns out amazing. And you really only need green wire and maybe a twig wreath base if you want your wreath to look a little more perfect. You can forage the greenery which would be ideal because FREE, although much easier if you don't live in the concrete jungle. (I got mine at a farmers market and a near-by greenhouse.) Regardless, they are so easy and satisfying and if you need some ideas, check out our previous post here. I linked some of the buyable pieces in case you are interested in getting the look! (See Target.) Enjoy!!! mixing + matching: palms and fronds! We have a new post to introduce! Welcome to our blog, Mixing + Matching. It involves lots of pretty fabrics, colors, and prints and of course, recurring themes. It's summer!!! Time to celebrate visually and feast your eyes on some whimsical summery collections for your interiors. We are searching high and low for the right fabrics for a client and couldn't pass up a few fabric samples along the way. What are the recurring themes, you ask? Good question! First, and most obvious: PALMS AND FERNS! You know, huge trend right now and festive for the summer months. Option 1 is playful, hollywood glam, bold, bright and totally appropriate for your dream 60's modern California split-level vacation ranch with a pool. (Is that on Airbnb? Because I want to stay there.) If by chance, you live in the New York / New England area, you'll notice there isn't the beautiful thing of the palm tree. We have FERNS here. Which are just as pretty, right? Option 2 is for your beachy Block Island gray-washed teak-shingled house with a pool's screened in porch. A fun combination of patterns and color and totally fitting for New England. (Gonna be an awesome screened-in porch.) OK, let's get real. Not everyone has a place like this- but no one will stop us from using these fun combos regardless of location or home size! ALSO, both collections have the colorful flame stitch that always makes us weak in the knees. Mix those colors and patterns!